Our patients are excited to get braces on, but also excited to get them off and see those brilliant, beautiful smiles that come from orthodontic treatment! Your commitment to treatment protocols and caring for your braces can affect how long your treatment takes. While there is no way to predict exactly how quickly your teeth and bite will move into their correct position, there are ways that you can help the process move forward rather than backward. 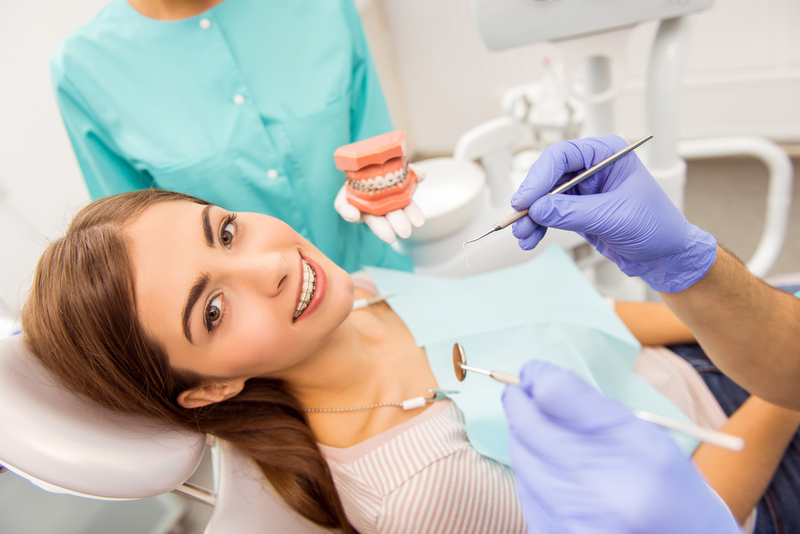 Here are five ways you can be a proactive patient and avoid causing progress delays during your orthodontic treatment. As always, your Belmar Orthodontics team is here to help answer any questions you have along the way. What is the Average Time for Orthodontic Treatment? One of the first questions we are asked by adults and kids alike, is how long will I have to wear my braces for? The answer to this question varies greatly depending on the severity of dental issues of each patient, but a large part of this answer relies on the patient and his commitment to following treatment protocol. Adults usually wear braces between 12-20 months and kids are usually closer to 2 years. Why the shorter orthodontic treatment time for most adults? Adults are usually more apt to wear their bands and follow all the prescribed instructions and rules for the braces. You are already on the road to quicker more efficient orthodontic treatment because of your decision to become a patient of Belmar Orthodontics. Dr. Hardy uses the newest and best technology available which helps them offer you a better product, more precise treatment and better results. Part of the mechanism of braces involves regular adjustments and tightenings of the appliance. Sometimes brackets have to be moved into other locations. Sometimes wires need to be adjusted. It varies from appointment to appointment based on how your mouth responds to treatment. Striving to meet all your appointments is an essential part of your treatment progress. When you stretch out your adjustments it gets you off track and impedes your progress. Commit to making your orthodontic appointments a priority and you will help to avoid delays in your progress towards a straighter smile. Part of your treatment with braces that require a bracket system (that is all orthodontic treatment options except for Invisalign) is the use of orthodontic rubber bands (elastics) to aid in the teeth-straightening process. These rubber bands may be small, but they do not play a small role in the process. They are used to help your bite achieve the proper alignment necessary for you to bite down normally. Choosing to opt out of wearing your bands will increase the overall time you will need to wear your braces. On the other side of the coin, the more diligently you wear your bands, the sooner you can achieve a healthy smile and have your braces removed. Sometimes patients are surprised to learn that their orthodontic treatment can be delayed if they don’t practice good oral hygiene. They don’t see this as being related to treatment delays–but it is. Braces that aren’t cleaned after every meal, or that never see a floss threader or proxy brush, suffer. Eating foods high in sugar also increases the risk of cavities, especially while wearing braces. Food particles that aren’t removed from your braces don’t just build-up on your teeth in the form of plaque and bacteria, they also build-up on your brackets. Plaque is a colorless, sticky film of bacteria that forms in your mouth from saliva and food particles. Plaque starts to form in your mouth just 4-12 hours after you eat! When plaque combines with sugars it forms an acid that eats away at the soft tissues/structures in your mouth. This same plaque that eats away at the enamel of your teeth can eat away at the brackets and the glue that keeps your brackets in place. Brackets and wires that become damaged or that break require extra visits to our office and extend your treatment time–and the cost of your treatment. On top of this, if you develop cavities, gingivitis, or demineralization during your orthodontic treatment due to not practicing good oral hygiene, your orthodontic treatment time can be delayed while your dentist works to correct these dangerous issues. When it comes to taking care of your braces, each treatment method has slightly different instructions and things to consider. If you are a patient of traditional metal braces, clear ceramic braces, or lingual braces your care instructions are going to be quite similar because all of these orthodontic treatment options use a bracket system that is affixed to your teeth. Brackets and wires can all entrap food particles. They are also not invincible materials so they come with some food restrictions. In order to avoid damage to your braces and your teeth during orthodontic treatment, hard foods, sticky foods, and foods high in sugar should be avoided. Taking care of your braces means you are cleaning them after each meal, flossing–with a floss threader when needed and/or using a proxy brush, and brushing them thoroughly. Avoid the most common orthodontic emergencies by following the tips for caring for your braces. By choosing to join the Belmar Orthodontic family, you not only benefit from expert skills and state-of-the-art technology, but you also enjoy the orthodontic treatment process as you work with our friendly staff and doctors. Dr. Hardy is committed to your care and will help you reach your smile goals as quickly and efficiently as possible. As you do your part to follow their suggestions and treatment instructions you will find success with your treatment and be flashing your beautiful smile every step of the way. Contact our office today at 303.225.9016. We are excited to meet you and help you reach your smile goals!